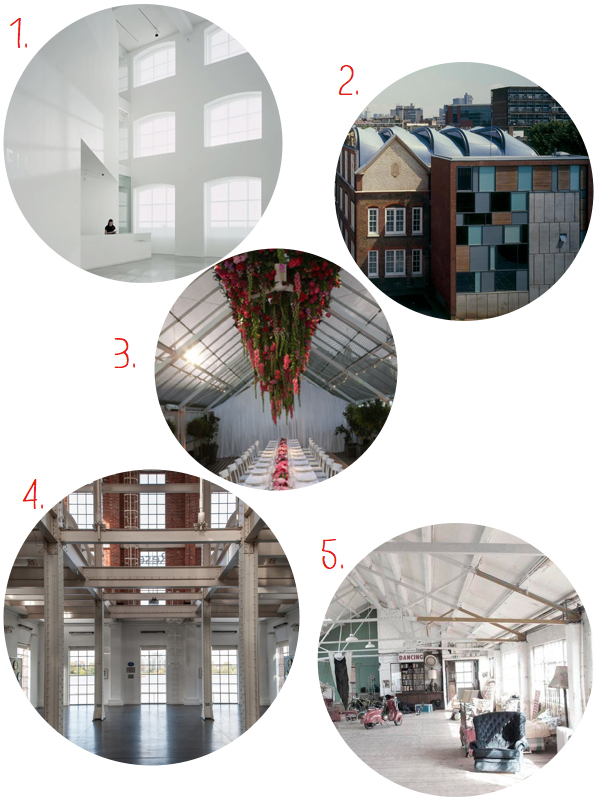 Since the start of the year I’ve been doing a lot of venue searching for my clients so today I wanted to share my top 5 contemporary London wedding venues find. 1. 3 Olaf Street is not your typical blank canvas space. The old coach builders factory has undergone a major revamp at the hands of famed architects Borgos Dance, yet the space maintains the plethora of windows and high vaulted ceilings. Fashionistas will also love that it is a stone’s throw from Westfield and also acts as the headquarters for some very famous brands! 2. Architecture lovers will definitely fall for RIBA award winning, Siobhan Davies Studio. It’s been a winner with one of my couples looking for contemporary London wedding venues as inside there are various spaces on offer including a spacious roof studio and it holds a civil wedding license too. 3. Clifton Nurseries is such an elegant gardening emporium seeped in history and hidden away in Little Venice. Although the gardens themselves date back to 1851, the glass houses have been renovated to provide a picturesque backdrop for nature loving couples. 4. I have quite a few weddings this year at West Reservoir Centre, a stunning 1930’s red brick tower that sits on the water’s edge near Manor House tube. The internal structural contrast has real wow factor and those beams lend themselves to hanging wedding decorations perfectly. 5. The final destination on my top 5 contemporary London wedding venues list is Dalston Heights. The huge space that sits on the top floor of a former cardboard box factory in Hackney is a great space for couples looking for a warehouse party vibe. The spaces are filled with a vast collection of eclectic props and furniture which can be arranged to suit or dressed just as you like. Now that saves on a big hire cost for props!